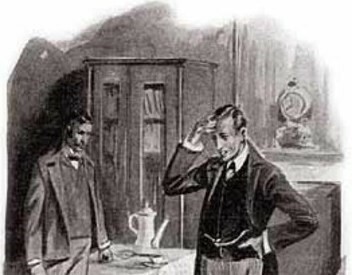 "The Five Orange Pips", one of the 56 short Sherlock Holmes stories written by British author Sir Arthur Conan Doyle, is the fifth of the twelve stories in The Adventures of Sherlock Holmes. The story was first published in The Strand Magazine in November 1891. Conan Doyle later ranked the story seventh in a list of his twelve favorite Sherlock Holmes stories. This is also one of only two Sherlock Holmes short stories where Holmes' client dies after seeking his help.